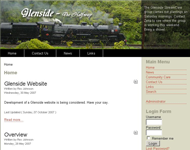 At the end of 2007 Rex and Claire developed the Glenside website. Rex has continued to provide voluntary administrative support for the website and to the Glenside Progressive Assn. despite taking up a new job in Australia. He exchanges emails three or four times a week with Claire on website matters. In 2008 Rex contributed 20-35 hours effort over two weeks enabling the website to transfer smoothly across to a new server. The website is fulfilling its purpose to inform, educate and network locally and internationally on the Glenside community.